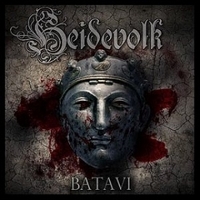 Heidevolk is the metal band who is interested and focused around their own historic upbringing, and in their new album Batavi they highlight historic events from the early Europe district called Germanica, a place that were widespread across a very big area but later were concentrated in the land near the sea, known as The Netherlands, Holland. There, in Batavorum, the old Batavian tribe was formed as they were to make a rebellion against the rulers in the Roman empire. The precise area is located in Frijsenland on the Dutch west coast, and even nowadays there are references to the legend, as the famous bicycle factory in the district bears the name Batavus bicycles. The clash against the Empire is described in many movies, so since they are interested in their own history it was natural for Heidevolk, who was earlier known as Hymir, to make a new album, and as usual all the lyrics are in Dutch language. Nevertheless it is a great album, powerful with folklore and pagan metal from their hearts. The first song, Veleda, is an introduction with Spanish guitar and violins to create the right atmosphere. Een Nieuw Begin is very scary metal coming from the preparations for the fighting, the music is almost Dschinghis Khan in it's appearance. Wapenbroeders is without doubt the best song on the album, deep serious vocals, violins and power metal that end of fighting spirit as vivid as if they were standing on your own doorstep. Het Verbond Met Rome gives us metal war as the rebellion is right in progress, you can feel the intensity in the song as it is power for their attacks. Vrijgevochten makes time for heavy storytelling to keep the listener informed of how the rebellion goes, and the tale is followed by powerful guitars to get their message more understandable. A great way to make history accurate and put into music. 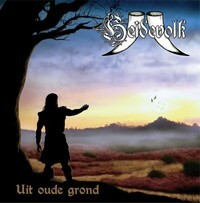 Uit Oude Grond (trans: From Old Soil) is the third full-length offering form the extraordinary Dutch sextet Heidevolk. This album continues the groundwork laid down in the previous albums which combined the dual male vocals of Mark 'Splintervuyscht' and Joris 'den Boghtdrincker' over catchy yet heavy guitar and drum work and traditional folk instruments. As soon as the first track starts the music is instantly recognisable as Heidevolk. Nehlennia has a nice catchy intro that instantly hooks the listener and softens into a slow pace like a lull in a storm before the fury is unleashed once more. This is true Heidevolk style and a great way to open the album. By the time the singing starts you're once more being dragged into the myths, legends and history of ancient Gelderland. Now where's my drinking horn...? Some parts of this album seem even more upbeat than is usual for Heidevolk and I suspect a lot of the influence for this is from the two ex-members of the now sadly defunct Thronar, guitarist Reamon 'Bomenbreker' and drummer Joost 'den Vellenknotscher'. This influence shines through in many of the songs, especially Dondergod. That being said it is still undeniably Heidevolk and this subtle influence adds to the appeal of the band rather than detracting from it. I would say without doubt this is Heidevolk's strongest release to date and certainly my favorite album. The production is far better than the first album, De Strijdlust is Geboren. Uit Oude Grond is very much a continuation of Walhalla Wacht, but in my opinion this latest offering contains songs that are even more enjoyable that the second album! If you're a fan of Heidevolk you will know what to expect from this release and I doubt you will be disappointed. It is Heidevolk doing exactly what they do best but taking it to the next level. If you're not a fan then this album won't make you change your opinion. If by any chance you haven't yet heard this band then you absolutely have to listen to this album!